The week's View comes from Kristin Shaw of Two Cannoli. She is a freelance writer, wife, and "mama to a mini-Texan". She is also a highly respected blogger who has been chosen as a Babble Top 100, and she was recognized as Type-A: We Still Blog awards finalist. She was a 2013 cast member and 2014 co-producer of the Listen To Your Mother show in Austin. She was recently named a BlogHer Voice of the Year reader for 2014, and she writes for the Huffington Post. Phew! I am very pleased to have Kristin here today, with something I for sure can relate to. My portfolio sagged with the weight of unrealized dreams. Turning to words, my other love, I put my time my senior year into completing the yearbook as co-editor, and my spare time into theater. Music filled the other spaces between. Art took a back seat for awhile, but I never forgot. I still draw in the margins of my notebooks during meetings. Characters and animals drawings decorate my son’s Magna-doodle. My son, on the other hand, has no use for art. He scribbles with crayons for less than ten seconds, and is done. He doesn’t draw people, or animals, or things. He is excellent at writing his name, and draws squares and circles like a pro. He would rather be using his hands to interchange Lego character pieces and his voice to create conversations. He would rather hold a bat than a crayon and a baseball rather than a piece of chalk. Last weekend, he decided that he wanted a Star Wars stormtrooper mask – his friends at preschool are very much into the Star Wars genre and he requested I check out just about every Star Wars easy reader in the library. I took out posterboard and a pair of scissors, and free-cut a stormtrooper mask based on the shape of one of his Lego minifigures. Drawing the face on with a black dry-erase marker and cutting out misshapen eye holes, I strung together some rubber bands as a way to hold the mask on his little head. I went out that night with friends, and the next morning, he showed me the C3PO mask, with scribbles of black all over it. “Look what I did, mom!” he said proudly. I felt a twinge of disappointment, and masked it immediately. His wide smile was his answer. That night, I told my husband that C3PO had been defaced. “That’s not how he sees it,” my husband said. Ah, yes: I forgot to look at it through his eyes. The eyes of a boy who doesn’t believe in his artist’s hand; the feel of a crayon is foreign to him. He created his own art in his own way, and it made him happy. I forget, sometimes, that he is not me. When he started preschool, I told him the story about how I walked into my own nursery school, said, “Bye, mom!” and didn’t look back. We practiced and role played and sure enough, on his first day of school, that’s exactly what he did. Except that wasn’t his story. That was MY story. He was repeating what he had been told, but it wasn’t how he was feeling. He played the part of the brave boy, and he did well. Later in the year, his true feelings emerged. We had a period of not wanting to go to school because he was afraid of the kids a year older than he is. We are still in a period of not wanting to go to swim class because he is afraid of the new kids. He is shy and reserved at heart. He does not like change or new people. I struggle to understand, sometimes, pushing him past his comfort zone in an effort to get him to budge from his position; I was born to be around people. I need people and I thrive in new situations. I may blush easily, but I have never been shy. He is not like me. It reminds me of something I heard recently: children are a mystery to be uncovered, not a shape to be molded. It’s something I’m learning more slowly than I should. 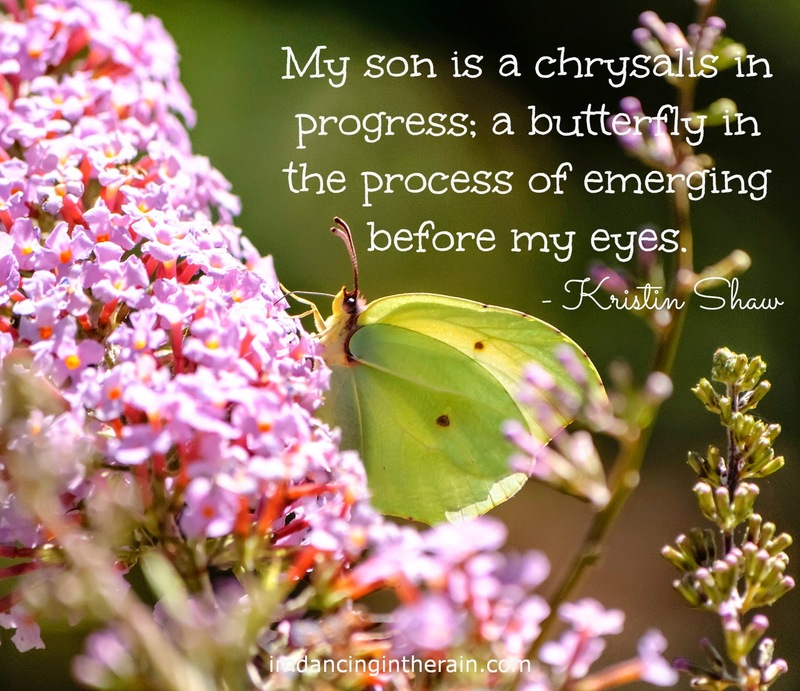 My son is a chrysalis in progress; a butterfly in the process of emerging before my eyes. He is a misty, foggy morning waiting to be illuminated by the sun. I don’t want to shape him. I want him to shape himself. And he will. He is a new, unique, individual, beautiful little person. I have to let him be HIM. Not me. I have a feeling he’s going to be much more interesting that way. I can relate to this so much because of how different my daughter is from me. I have had to let go of any notions that she will think or act like I did as a child. And it's OK. She's pretty awesome.